We manufacture the pizza boxes and other food packaging boxes which are best in quality and of food grade. We manufacture these boxes as per client's requirement i.e. the shape and the sizes required. We also do the printing of your business messaged over the boxes. 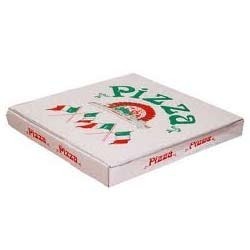 We can also supply un printed pizza boxes to meet your packing requirement. Lion Packs was incorporated in the year 2006 and has gained recognition as a leading manufacturer and supplier of Packaging Material. The products offered by us include Multi Color Duplex Boxes, Printed Corrugated Boxes, Pallet Boxes, Corrugated Liners, Paper Boards, Heavy Duty Corrugated Boxes, Corrugated Boxes and many more. Our products are manufactured using finest quality material, which is tested by our experts on different parameters before using them in our production process. We possess a sophisticated infrastructure, wherein advanced machinery and tools are installed by us. Through this, we are able to manufacture flawless products within the committed time period. To carry out systematic production process, we have with us a team of qualified professionals that is experienced in efficiently handling the machinery installed in our production department. Therefore, we are able to ensure the delivery of our products within the committed time frame.